The Bharat Sanchar Nigam Limited has successfully conducted the Junior Accounts Officer Exam 2017 on 5th November at numerous examination venues. 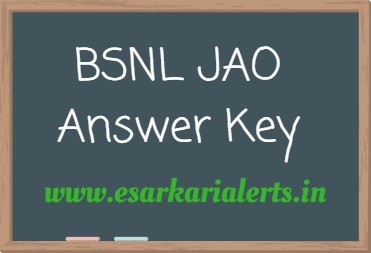 After attending the exam, aspirants are looking here and there for the BSNL JAO Answer Key 2017 that will be issued soon by the BSNL. The participants are recommended to stay in touch with us for the latest updates on this exam answer key. The Bharat Sanchar Nigam Limited has conducted the BSNL Junior Accounts Officer Exam for the staffing of eligible candidates for total 996 vacant positions of Junior Accounts Officer (JAO) in the department. Those who will qualify this examination they will be recruited on these posts. Thus, this exam is a great chance for those job hunters who want to get a government job in BSNL. The date of BSNL JAO Exam was 05.11.2017. 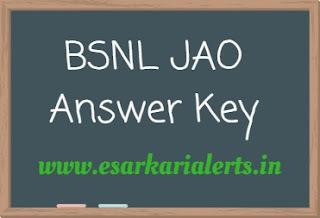 We tell our readers that the BSNL will soon release the BSNL JAO Exam Answer Sheet. They are advised to stay tuned with www.esarkarialerts.in. The organization will release the exam solutions of this recruitment test on its recruitment portal which is www.externalbsnlexam.com. After logging on to this website, you need to check the section of this recruitment process. After that, click on the link to answer key and match your answers with the authorized answer sheet.